The Take away – The most important variable in energy consumption and carbon dioxide production in food is in your hands – the way you cook your food is the major leverage point in the total food production-consumption system – are you cooking with the lid on the pot? With the rise of globalisation it is no surprise that food production has been globalising too. Examples such as Salmon farmed in Canada and flown to China for processing before being flown to California have many people interested in sustainability and global warming up in arms. One response to this concern, that globalisation of the food chain is contributing to a rise in energy consumption and carbon dioxide production, has led to the concept of food miles – the distance that food travels from where it was produced to where it was consumed. Local food production and local growers markets are also on the rise – in part driven by the desire to have fresher food that has lost less of its nutrients due to long travel times and cold storage. 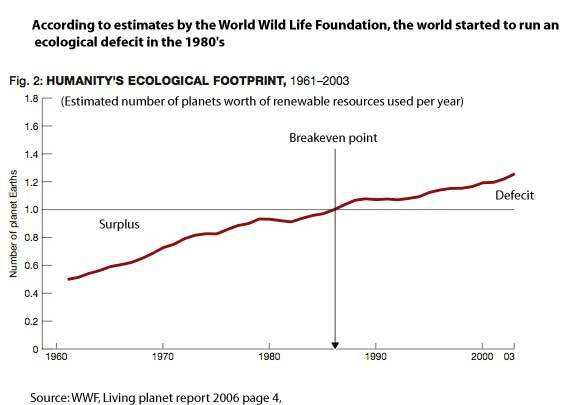 While one response is to feel relatively powerless against the perceived “monster of globalisation” for threatening our sustainability, it turns out that our intuitive analysis of the situation is in many cases simply wrong. The fact is, that in the case of food that we buy and cook at home, we the people are responsible for the largest use of energy and production of carbon dioxide in the total food supply chain. For some reason when most of us think about the energy used and carbon dioxide produced with food only think about it in terms of the food we buy in the shops – we forget about the energy that we use to get to and from the shops to buy the food, the energy we use when we cook the food (and wash the dishes) and the energy used in disposing the waste. When we add these energy consuming stages into the equation to get a full “seed to waste life cycle analysis” it turns out that the major energy consuming steps in the chain are created by us driving to buy the food and cooking the food. And of these two cooking takes up the most energy. And this analysis excludes the energy cost of washing the dishes. 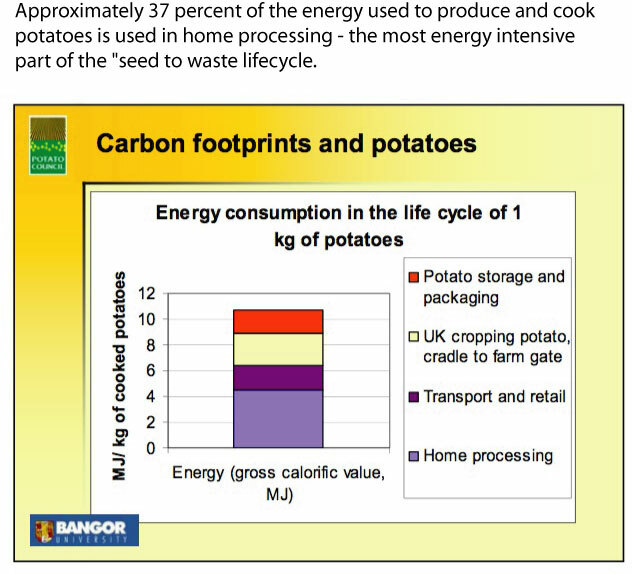 You can see this represented graphically in two charts I found on the internet that measure the total carbon footprint / energy consumption for potatoes and broccoli in the UK. 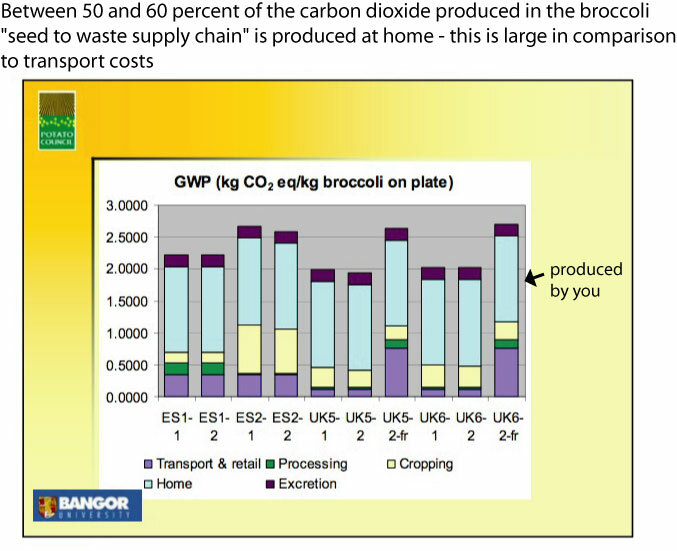 For those of you who aren’t that good with graphs, the vertical bars in each graph measure the total energy used / carbon emitted to deliver one kilogram of potatoes and broccoli to the plate at home. The different energy consuming steps in this process are represented by the different colours – the hights of each colour represents the amount of energy used in that stage. As you can see if the case of potatoes, approximately 11 mega joules (M J) of energy is consumed getting a kilogram of potatoes to a cooked state. And when you look at the light blue part of the bar you can see that just over 4 M J – about 37 percent – is used by us processing the potato at home. And this excludes the cost of driving to buy the potatoes. In the case of broccoli – the graph compares broccoli sourced from Spain and the UK. The vertical bars measure the amount of carbon dioxide produced in the chain and the light green bars – the biggest in all cases – represent the energy used at home. This varies from around 50 to 60 percent of the total carbon dioxide. The bottom line is that you can save more energy and carbon dioxide emissions by boiling your potatoes with the lid on the pot than by buying local produce. In terms of transport economics the car is the most energy intensive form of oil powered transport. A large ship can carry one ton of food 8oo miles on a gallon of fuel. In comparison a train can move the same ton 60 miles, a truck 20 miles and a car 10 miles. When you see these statistics it is easy to see why the cat of driving to the shops to buy food is a relatively energy intensive part of the food chain. Back in December 2008 I wrote the post titled “Financial Depth” and sophistication or “diminishing Marginal returns” and Collapse. 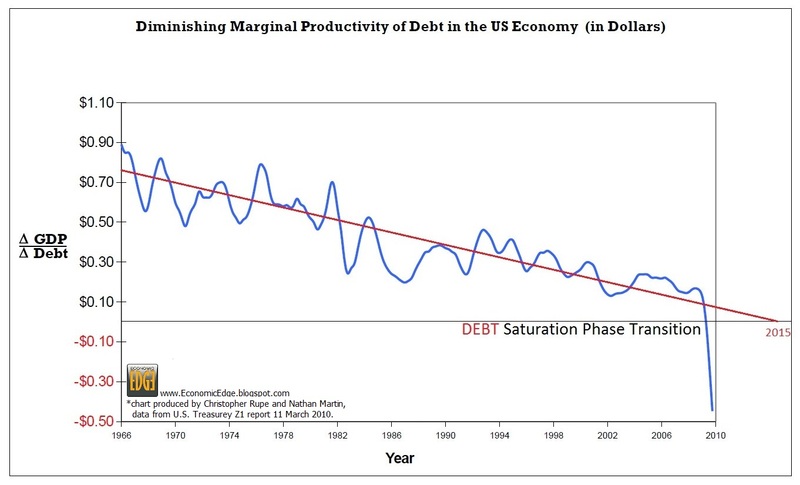 In this post I pointed out the trend in the USA of the “Diminishing Marginal Productivity of Debt” as illustrated in the chart below. 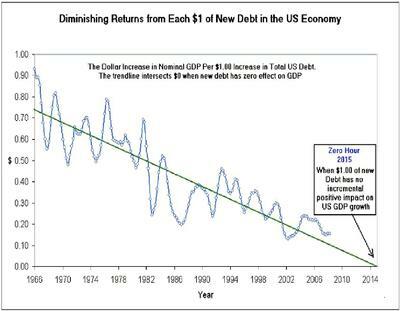 What this trend is pointing out is that each new dollar of debt has been producing less and less economic growth over time – another way of saying that each new dollar of economic growth requires more debt. The trend line on the chart suggested a “zero hour” in 2015 – the point where new debt stopped producing economic growth and started to destroy economic growth. I suggested that when the USA reached this point it would start to collapse because it would no longer be able to solve any emerging problems. New problems cost money to solve. But in this state of negative marginal debt productivity any new debt raised to solve the problem would make the situation worse not better. Joseph Tainter had found this to be the common cause of the collapse of 24 civilisations he had studied. New data from the latest U.S. Treasury Z1 Flow of Funds report was released on March 11, 2010. The chart for this data is below. And it looks very very bad. By the end of 2009 each new dollar of debt was destroying 45 cents of GDP. – the report and update of the chart from this data is available at http://economicedge.blogspot.com/2010/03/most-important-chart-of-century.html. The mathematic underpinning the reason for this trend are simple and are an inbuilt property of our capitalist system which requires exponential growth to function and where new money is loaned into existence . The outcome is entirely predictable and inescapable. Unbelievably this has escaped classically trained economists the world over. Productivity growth means that every year the same amount to goods and services are produced by less people. In this situation, if there was no economic growth, productivity growth would result in increasing unemployment. And if population growth was added, unemployment would rise even faster. This type of situation could not last for long – people would soon be starving and the government would be thrown out. The solution has been to growth the economy fast enough to at least maintain stable employment. In countries like the USA and Australia this requires real economic growth of around 2.5% a year. Anything less and unemployment starts to increase. Real life data from Australia and the USA demonstrates this relationship – the change in unemployment is completely correlated to the contribution that new debt plays in the economy. The correlation for the USA is exhibited below. Economic growth requires new debt and because this debt grows faster than the economy the debt to GDP ratio increases. 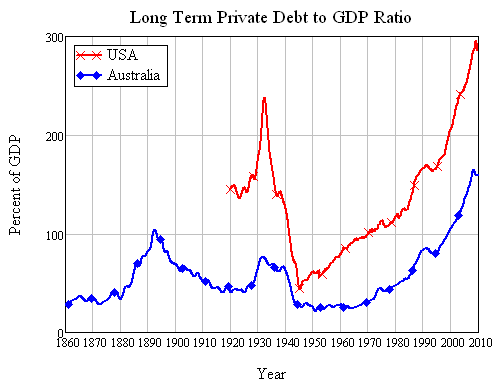 In Australia, for example, debt grew 4.2% faster than GDP between 1964 and 2008 (with a correlation coefficient of 0.994). 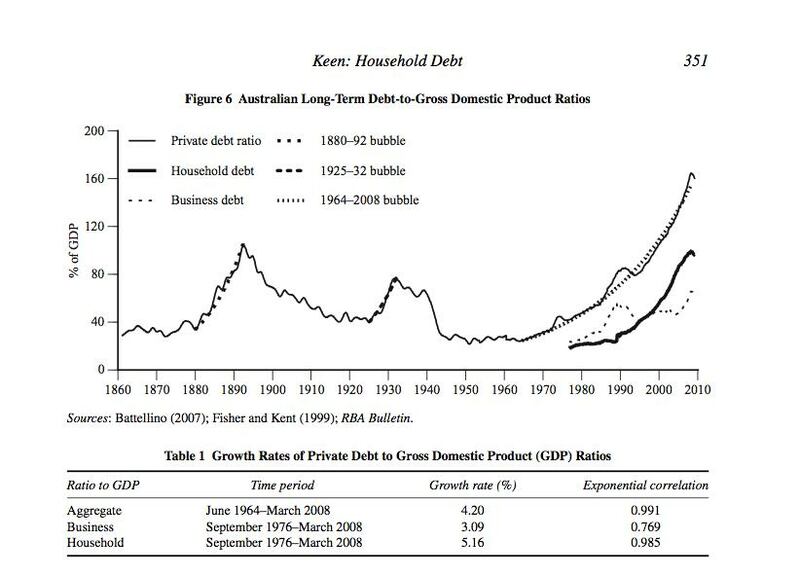 The end result are the “hockey stick” graphs for debt to GDP ratio’s – the graphs that show the diminishing marginal productivity of new debt to produce economic growth are simply mirror images of these. Eventually interest payments on debt swamp the economy. We sustained this growing debt burden by reducing interest rates and pretending that we didn’t have rising debt but rather we had rising profits from the inflated asset prices that this additional debt produced – without this the US economy would have hit the straps long ago. However with interest rates at almost zero there is no more room to move. Game up. 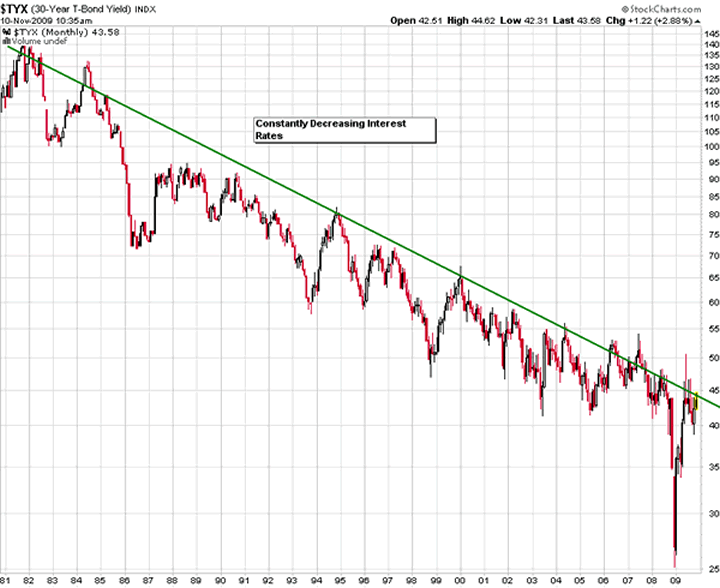 This chart shows how long term interest rates as measured by 30 year treasury bonds have been trending down since the 80’s. Yet the type of collapse that Tainter is talking about is not simply driven by financial collapse – money is easy to debase. It is easy for government to “print” new money and give it new names like “quantitative easing” to hide the fact. Other tactics used by governments of all persuasions are to change the way statistics are collected – typically to make high inflation look lower than it is, to make low economic growth look higher than it is and to make high unemployment look lower than it is. This is why Tainter uses the concept of Energy rather than money. Energy is what really does the work in the universe. When a country starts to collapse inflation soars like it did recently in Zimbabwe. A friend of mine from school days who still lives in Zimbabwe and runs a mining business there only works with diesel fuel as his currency for exactly this reason. 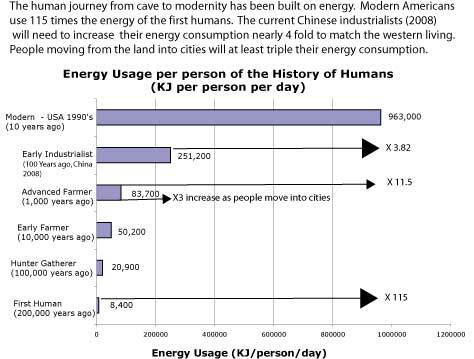 What is unrecognised by economists – who deal with money rather than energy, and who look at the world in the relative short term – is the historical development of the human species is a history of our capacity to harness greater and greater amounts of energy per person. This started right back when we learned to use fire. Our use of fire gave us the capacity to cook out food. Cooking allowed us to extract greater amounts of nutrition from our food and this facilitated the expansion of our brains. The industrial revolution and green farming revolution has been built on the back of fossil fuels and would have been impossible without them. There was a time when food was an energy producer. Now though modern industrial agriculture in the USA is a net energy destroyer that operates like a miner. – 10 calories of fossil fuel energy are required to produce one calorie of food. – Soil and nutrients are being destroyed faster than they are being replaced. In addition to energy we depend on ecosystem services for our survival. The unfortunate story around ecosystem services is two fold. The first is that we are amidst the 6th great extinction and this is being caused by us. Predictions are that we will have wiped out commercial fish stocks by 2050. The second is that we probably started to run down our ecological capital some time in the 1980’s. Given that we live on a single planet that has boundaries and limits this begs the question – what happens when we run out of easy energy and ecosystem services? The issue around peak oil is not that oil will run out. The issue is that as the supplies run down the net energy we get from fossil fuels declines. So when we used to be able to get 100 barrels of oil by using one barrel of oil to do the work to get it out of the ground and refined, one barrel of oil will now only produce 10 barrels of refined oil. There are people who believe that technology will somehow save the day. May be it will, maybe it wont. My hypothesis is that our first ponzi scheme started when we invented agriculture as a solution to the fact that the environment became unable to sustain a hunter gather lifestyle. This agricultural solution in turn created unintended consequences that we solved with further innovations. The whole history of innovation then has been a story of “solutions” creating new problems that were “solved” in the short run only to create bigger problems down the track. The moral of the story is that there are no permanent solutions to anything in a world that is constantly evolving. Moreover short term solutions create problems in the future. In other words, one ponzi scheme creates the need of a new ponzi scheme to solve its problems …. and so on. We are literally surrounded by ponzi schemes that most of us are ignorant or in denial about. Governments are particularly good at running up unfunded liabilities such as future health and pension costs. Recent research from the Societe Generale revealed the extent to which some governments have hidden their insolvency by hiding most of their liabilities. 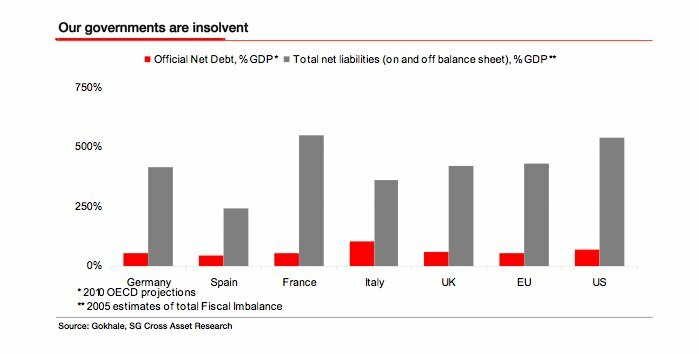 In the chart below the red bars for each country represent the liabilities that the governments have reported and form the basis that justify their policies and their legitimacy. The green bars represent the “real” situation. Are you panicking yet? Yet despite the fact that this information is available on the internet I can almost guarantee you that at least 99% of the population are oblivious of this situation. And, if the became aware of it, denial and instant forgetting of it would be the order of the day. When this observation that solutions eventually become problems is mapped onto the fact that the rate of change and innovation is increasing, it means that we are creating future problems for ourselves at a faster and faster rate. What this means is that new problems created by these “solutions” – which are currently hidden or not yet manifest – will also start surfacing at a faster and faster rate. And we live in an interconnected 24/7 world where we now demand “instant solutions” to problems as they arise. The consequence of this is extreme short term thinking. In this situation we are forced to respond to the surface level symptoms of the situation. There is no time to look for the causes and attempt to respond to these. Look at how bail out was presented by Hank Paulson – if we don’t act now we will collapse. And the result is that the majority of the people who didn’t see the GFC coming are still in power and their bonuses are even larger than before the crisis. At the same time as main street heads south. At some time in the near future we will be spending all of our resources trying to solve the problems that are currently “in the pipe line” as they mature into “sales”. This is when the collapse will occur. The question is not whether the USA will collapse – it is a question of when.